This special scheme Gulf Air A340 climbs away from runway 25L. 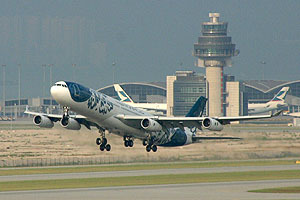 The airport is separated into two terminals, logically known as terminal 1 and terminal 2. Only terminal 1 is a traditional terminal, with aircraft gates etc. Terminal 2 is for bus/taxi/ferry connections, as well as a shopping centre. Generally speaking, the summer is hot and humid (around 30◦C). This is also the rainy season when there can be thunderstorms and typhoons. Autumn and winter are the dry seasons, and the temperatures are generally cooler. Temperatures in winter can drop below 10◦C. When going outdoors, please remember that the sun can be very hot, and many of the spots have no shade or water available. Please go prepared! The weather in Hong Kong can be unpredictable. In fact it is often cloudy and rain is not uncommon even in the dry seasons. The Hong Kong Observatory issue warnings for heavy rain and for when typhoons are in the vicinity. Please heed these warnings; the weather can be extreme. A major problem for spotters and photographers is the amount of pollution and haze in Hong Kong. The haze problem is at its worst in winter, when northerly winds bring pollutants from mainland China. Afternoons are the worst, and visibility can be reduced to a 1 or 2 kilometers, making photography completely impractical. Hong Kong is a generally safe place, however the usual precautions should be taken. Many parts of Hong Kong are very busy, and pick pocketing and petty theft does occur, so please mind your valuables at all times! When spotting at the airport, do not stand next to airport fences, or use ladders. This is strictly forbidden. When spotting near the fences, please stand on the opposite side of the road. If you are approached by the airport security, please feel free to politely explain what you are doing, but comply with their instructions at all times. It is a requirement that when travelling in Hong Kong all foreigners have identification with them at all times (ie passport). 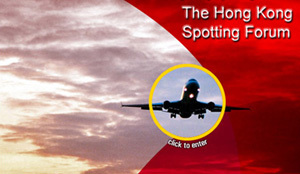 The Hong Kong Spotting Forum is the online meeting place of many of Hong Kong's aviation enthusiasts, spotters and photographers. Please feel free to drop by for a visit, or ask any questions you may have! If you will be visiting Hong Kong, don't hesitate to let us know; you may be lucky enough to find yourself a guide!